For most NJ home and business owners, landscaping is an excellent opportunity to create a property that is truly unique and that stands apart from the crowd. This can be accomplished in a number of different ways, but one of the simplest and most effective means of establishing a one-of-a-kind landscape is through custom stone fabrication. Decorative and functional stones and pavers add elegance, sophistication, and charm to any property even without alterations, but having the ability to customize the materials to suit your every whim enables you to make your landscape truly your own. With a number of different options for customizing stone, your next project is only limited by your imagination. 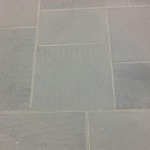 One of the things that people love most about working with natural stone and concrete pavers is that the materials can offer a very natural, old world or even rustic look to specific features throughout the property’s exterior and interior. In some cases, though, you may fall in love with a specific type of material only to discover that it may appear slightly too uniform or manufactured, or that it doesn’t have the exact texture that you were hoping for. In these instances, you can customize the stone to meet your unique demands. 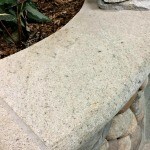 Rock facing is the most common form of custom fabrication. 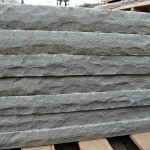 Here, your stone supplier will chisel the face of the stone, resulting in an attractive distressed look. This type of fabrication offers numerous possibilities for steps, stair treads, countertops, mantels, hearths, sills, wall caps and more. If sharp corners and edges aren’t your thing, you’ll definitely want to look into our bullnose option. This term refers to creating a convex and rounded trim for various masonry and hardscaping projects. While you may desire to have a bullnose edge done to stone used for countertops and stair installations, it is most commonly used for pool coping. Not only does this create a soft and elegant look, but it can improve safety for swimmers. Many people enjoy having their stone materials polished prior to installation. This form of custom stone fabrication is not only completed for decorative purposes, but also for practical reasons. For obvious reasons, the polishing of stone gives it a sleek and beautiful sheen that is esthetically pleasing. When done properly, the polishing can create an effect that is similar to what you would get with granite, but with a more rustic appeal. In addition to looking great, polished surfaces can be cleaned much more efficiently and effectively, and are far less likely to stain. Polished materials are generally used for indoor and outdoor countertops and can feature rock faced, bull nosed or thermaled edges. Thermalling is another popular form of custom stone fabrication. Here, a professional will make use of a very high temperature torch that is held over the surface or the edge of the stone material selected. The heat helps to create a finish with very interesting textures. Many home and business owners choose to have this type of fabrication done along stone steps, stair treads, countertops, mantels and sills. 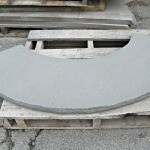 When you’re working with a stone material that is between 2-4″ thick, you might consider having radius cuts done. This type of custom fabrication requires a template paired with a lot of experience, care and precision. Depending on the job specifications, the radius will vary, and not one radius is ever the same. A lot of work must go into making sure that the cuts and sizing are done correctly. 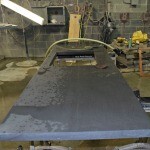 You’ll find that this type of fabrication is typically done for pool coping, countertops, wall caps and stairs. Custom engraving is a great way for you to make a statement with your stones, or keep a record of the passage of time. After construction is completed, many new businesses, school buildings, churches and other organizations will choose to have the year that the structure was built engraved into a stone. Homeowners, businesses and organizations alike may also choose to have their street addresses engraved into the stone of their choosing. You might even elect to have your family name engraved on a stone in front of your home. As you select the materials for your project, it’s important to keep in mind that not all stone can be custom fabricated. If you have your heart set on Kearney Stone, bluestone, limestone, brownstone and/or sahara granite, you’ll have a great deal of creative license. When you’re looking at stones that are over 6″, however, you should plan on leaving the materials “as-is”. If you have any questions about whether or not a specific type of custom fabrication is compatible with the stone you are considering, be sure to consult with an expert. 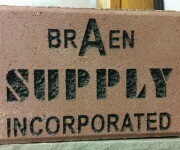 Braen Supply has the largest inventory of decorative stones and pavers throughout NJ and its surrounding areas. We offer a massive variety of landscaping materials, ensuring that you’re able to find stones that will look natural and beautiful throughout your property. Our team of experts is highly skilled in the art of custom fabricating stone and will take care to produce the look and feel that you’ve been dreaming of on a budget you can afford. Get in touch with a specialist at Braen Supply to discuss your goals for customizing your landscape.